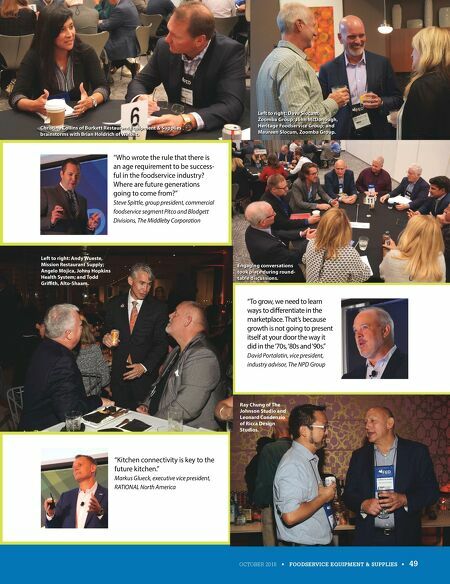 48 • FOODSERVICE EQUIPMENT & SUPPLIES • OCTOBER 2018 IMPROVING AUTHENTICITY "It's important to say we are going to be authentic or we are not going to do it all. We have to push ourselves to be great in every way." In saying those words, Angelo Mojica of Johns Hopkins Health System, Baltimore, was describing his success in developing award-win- ning foodservice operations. In reality, though, Mojica's comments apply to each and every company in the foodservice industry. Serving authentic food requires research, commitment and a solid equipment battery that helps celebrate the menu's authenticity. The senior director of food and culinary services has added everything from sous vide equipment, that he said allows the team to get salmon on a plate faster, to a rotary evaporator that concentrates beet juice down for an added punch of flavor to beet ravioli. "Use the right equip- ment," he advised FED Summit attendees. To develop the right menu and equipment platform, Mojica focuses on the uniqueness of doing what "no one else is doing" in the healthcare environment. Literally offering management a taste of the culinary vi- sion does not hurt, either, he added. Using the right equipment not only enhances taste and authenticity it also helps manage food costs. Mojica pointed to a pizza oven his operation uses as an example. Because of the way the pizza cooks, the fresh mozzarella spreads in way that staff need to use less of the topping to create a visually full pizza, thus lower- ing food costs and enhancing margins. Mojica's drive for the right equipment comes from his vision to push food beyond what people may think of when they hear a term like "hospital food." He chooses to push the boundaries and wants to match the latest and greatest in the restaurant marketplace. "To ensure that we are able to delight our customers, we need to know what they are thinking and feeling and establish accountability for it internally. We need to own it." 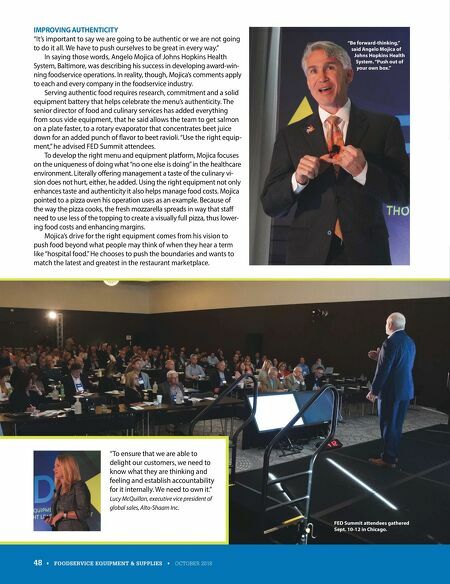 Lucy McQuillan, executive vice president of global sales, Alto-Shaam Inc. "Be forward-thinking," said Angelo Mojica of Johns Hopkins Health System. "Push out of your own box." FED Summit attendees gathered Sept. 10-12 in Chicago.